Green thumbs and dirty nails...: Potatoes. This year for my potatoes I tried out a method I saw Alys Fowler use during her Edible Garden series. She grew potatoes in pots on her patio in an attempt to save on space. Film vision showed Alys tipping out said pots causing a cascade of dark soil and golden tubers. What success she appeared to have! I decided to give it a try for myself. 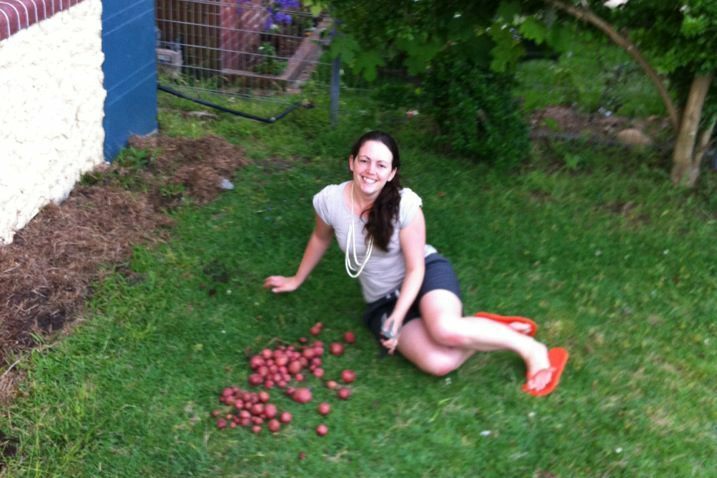 This terribly grainy photo above shows my potato haul around this time last year. I had buried the potatoes in my front garden as there was plenty of space to grow a decent sized crop. And yes the crop did do reasonably well. However, it was evident from the size of the yield that the plants did not get enough sunlight in this position. This year I planted five potato halves in some good quality compost in the base of a large black plastic pot. I had read that if you plant the potatoes at the base with enough soil to cover, you can then add more and more soil as the plant grows, and this encourages the tubers to be produced all the way up the pot. It appears that I did not do this quickly enough, I allowed the plants to become established before I piled more soil on top of them, with this resulting in potatoes only to be found in the bottom half of the pot. I am definitely going to plant my potatoes in pots from now on. Once planted they do not take a lot of work, and if I do the soil addition correctly next time, I should yield a whole lot more delicious potatoes. Nothing beats a home grow potato! We steamed some last night steamed to have with dinner. They were served with sliced shallots and some salt and pepper. Yum potatoes! I recently planted some, but in reality I have no clue what I'm doing. If the little potato stem pops out I'll have to try topping it up! That's a nice pile of potatoes that you grew there Sam. How long was it before you put the extra soil on top? I want to have a go at potatoes in pots rather the ground sometime. I read in a book that you can use bags to grow them in, and roll down the sides while the soil level is lower to give the plants more light.